Bring style and dimension to your bird garden while supporting cancer research by placing this Wing and A Prayer Cancer Awareness Classic Bluebird House in it. 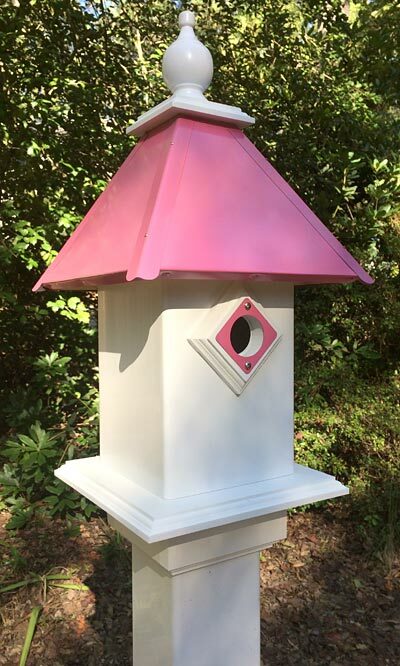 This hardy and beautiful structure provides bluebirds a welcome roost, while its bold, pink roof shows your commitment to eradicating breast cancer. The tall home, crafted from square PVC tubing, offers bluebirds a comfortable nesting site, and the unit will not mold, mildew, or rot for a lasting shelter. A 1.5" diameter entry hole rests on one side of the home, surrounded by a pink, metal guard for protection from predators. The four sided, metal roof not only keeps the interior of the home shielded from the elements; it also makes a statement in your garden by supporting breast cancer research. This makes the shelter perfect for use in fundraisers, or as a gift for a loved one affected by the disease. A white finial tops the roof, adding height and style to it, and this entire top assembly may be removed for nest checks and cleaning. Place the attached mounting collar over a true 4" x 4" post (not included) for a lasting and fantastic display. Support both birds and cancer research with this Cancer Awareness Classic Bluebird House. Made in the USA. Note: With each purchase of this home, $10 will be donated to cancer research.